It’s been a rough week for Boston sports fans. The Bruins lost the Stanley Cup, Aaron Hernandez was arrested on murder charges, Doc Rivers left, and now, the heart and soul of the Boston Celtics are leaving town, too. The Brooklyn Nets and Boston Celtics have agreed on a trade that will send Paul Pierce, Kevin Garnett, and Jason Terry to the Brooklyn Nets in exchange for three first-round picks (2014, ’16 and ’18) along with Gerald Wallace, Kris Joseph, MarShon Brooks, Keith Bogans, and the expiring contract of former Mr. Kim Kardashian, Kris Humphries. 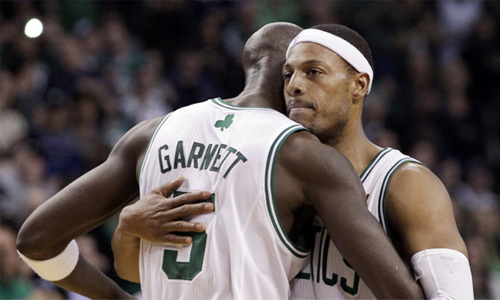 Garnett waived his no-trade clause to finalize the deal, which will now have him and Pierce playing under first-year head coach Jason Kidd, who Pierce played against in the 2002 Eastern Conference Finals when Kidd was the point guard of the then-New Jersey Nets. The Nets are looking to add some firepower to their offense, headed by Deron Williams. But with Pierce and Garnett on the downside of their prime, it’s hard to imagine Brooklyn getting more than a year or two out of each player. For Boston, the trade is a clear sign that they are in rebuilding mode and that it’s an end of in era in Beantown. The team will likely look to build around All-Star point guard Rajon Rondo, who had ACL surgery in February. Given how deep the draft class of 2014 is projected to be, getting another first round pick in their arsenal might be the best thing to do at this point.